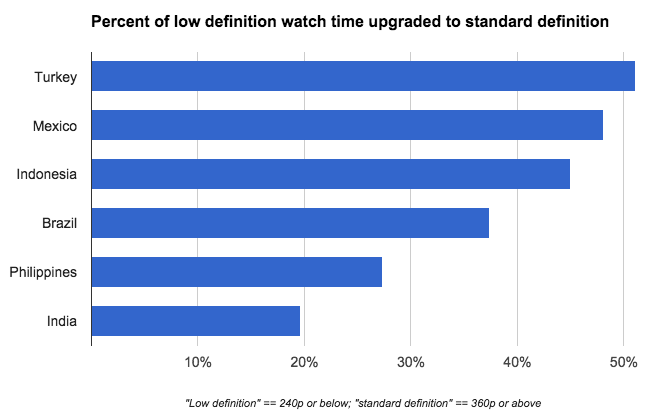 As more people watch more high-quality videos across more screens, we need video formats that provide better resolution without increasing bandwidth usage. That’s why we started encoding YouTube videos in VP9, the open-source codec that brings HD and even 4K (2160p) quality at half the bandwidth used by other known codecs. VP9 is the most efficient video compression codec in widespread use today. In the last year alone, YouTube users have already watched more than 25 billion hours of VP9 video, billions of which would not have been played in HD without VP9's bandwidth benefits. And with more of our device partners adopting VP9, we wanted to give you a primer on the technology. Videos hold a lot of information. If video were stored in the same format that a camera sensor uses when shooting a scene, the resulting files would be enormous — raw 4K is up to 18,000 Mbps! Instead, modern video compression looks at a video more like a person might, by encoding a description of the features in a scene, and tracking how those features move and change. This compression is hundreds of times more efficient than a camera sensor's recording and is what makes video streaming possible. This new format bumps everybody one notch closer to our goal of instant, high-quality, buffer-free videos. That means that if your Internet connection used to only play up to 480p without buffering on YouTube, it can now play silky smooth 720p with VP9. VP9 also has benefits for people with limited bandwidth or expensive data plans. By cutting bitrates in as much as half, it dramatically increases the set of users that can watch 360p quality video without increased rebuffering or cost. And for those who can never get enough pixels (including your humble author! ), VP9 unlocks the burgeoning world of 4K videos. At larger video sizes, VP9 actually gets even more efficient than its predecessors, so uninterrupted 4K content can now be streamed by a significant and growing part of the YouTube audience. The amount of 4K video uploaded to YouTube has more than tripled in the past year, and VP9 helps us plan for improved streaming into the future. You can find 4K videos by using the search filter, or see some of our favorites in this playlist. Where can I use VP9? Thanks to our device partners, VP9 decoding support is available today in the Chrome web browser, in Android devices like the Samsung Galaxy S6, and in TVs and game consoles from Sony, LG, Sharp, and more. More than 20 device partners across the industry are launching products in 2015 and beyond using VP9. To learn more about producing your own VP9 content, see our FFMpeg encoding guide or check out the Adobe Premier WebM plugin.